In addition to a full-service spa, New World Saigon Hotel features an outdoor tennis court and an outdoor pool. Dining is available at one of the hotel's 3 restaurants. Guests can unwind with a drink at one of the hotel's bars, which include 2 bars/lounges and a poolside bar. Public areas are equipped with complimentary wired and wireless Internet access. This 5-star property offers access to a business center and limo/town car service. 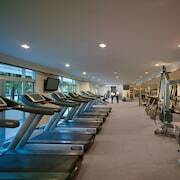 This luxury hotel also offers a fitness center, a sauna, and spa services. Parking is available onsite for a surcharge. New World Saigon Hotel is a smoke-free property. Located in Downtown Ho Chi Minh City, this luxury hotel is within a 5-minute walk of Bui Vien Walking Street, Zen Plaza, and September 23 Park. Ben Thanh Market and Tao Dan Park are also within 15 minutes. Saigon Railway Station is 29 minutes by foot. This smoke-free hotel features 3 restaurants, a full-service spa, and an outdoor pool. WiFi in public areas is free. Other amenities include 2 bars/lounges, a fitness center, and a poolside bar. All 533 rooms feature thoughtful touches like bathrobes and slippers, plus free WiFi and LCD TVs with cable channels. Other amenities available to guests include 24-hour room service, minibars, and coffee makers. New World Saigon Hotel offers 533 air-conditioned accommodations with minibars and safes. 32-inch LCD televisions come with premium cable channels and pay movies. Bathrooms include bathtubs or showers, bathrobes, slippers, and complimentary toiletries. This Ho Chi Minh City hotel provides complimentary wireless Internet access. Business-friendly amenities include desks and phones. Additionally, rooms include complimentary bottled water and coffee/tea makers. A nightly turndown service is provided and housekeeping is offered daily. Flights from Punta Cana Intl. to Vancouver Intl. Flights from Liberty Intl. to Orlando Intl.